Braised brisket with tzimmes, a classic dish for Rosh Hashanah, takes a new direction with the addition of hard apple cider. Slowly cooked and tenderly watched, grass-fed beef brisket is first seared in tallow then doused in homemade beef stock and hard cider and roasted in a clay baker or Dutch oven for several hours. 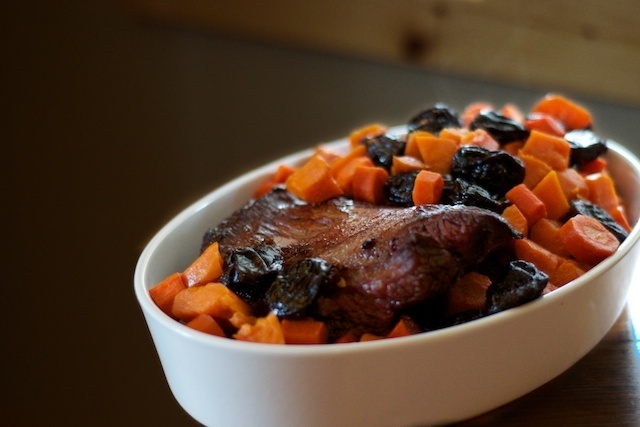 Sweet potato, carrot and prunes – a traditional combination of fruits and vegetables for the Ashkenazic dish called tzimmes – are added several hours after the meat has begun to roast so that they retain their texture without overcooking. Later, pan juices combine with even more cider for a mildly sweet and decidedly smooth reduction sauce. Sweet dishes, for a sweet year, are typically celebrated during Rosh Hashanah with both apples and honey featuring prominently in traditional menus while the naturally sweet tzimmes is a beautiful accompaniment. Beef seems to get a bad rap and while conventionally raised, grain-fed beef is certainly deserving of its ill reputation, grass-fed beef offers quite a different story. Grass-fed beef is rich in micronutrients – particularly B vitamins and trace minerals. Just a 100-gram portion contains over half the RDA for zinc, a mineral that is critical for immune function and reproductive health; moreover, brisket is also a good source of niacin and vitamins B6 and B12. Similarly, beef tallow – though much loathed by conventional dietary dogma – is a potently rich source of conjugated linoleic acid, a naturally occurring fatty acid with strongly anti-carcinogenic and antioxidant properties. This beneficial fat decreases significantly with the introduction of grain into cattle’s diet, meaning that grass-fed beef offers the most potent source while grain-fed, conventionally raised beef offers only minimal amounts – underscoring the importance of purchasing beef from farms and ranches following the sustainable model of holistic management in which cattle are rotationally grazed on rapidly growing green grasses, ensuring their meat and fat is of the highest nutritional quality. In brisket, monounsaturated fat and saturated fat are served up in roughly equal portions with monounsaturated fats (the dominant fat in avocado, olive oil, bacon fat and lard) only very slightly outweighing saturated fats. Brisket also contains a small amount of polyunsaturated fatty acids. In conventionally raised cattle fed on grain, those fragile polyunsaturated fatty acids are primarily composed of omega-6 fatty acids while in grass-fed beef, they are fairly equally composed of both omega-3 fatty acids (also found in ocean-going fish) and omega-6 fatty acids. This improved ratio of omega-3 to omega-6 fatty acids promotes good cardiovascular and metabolic health. 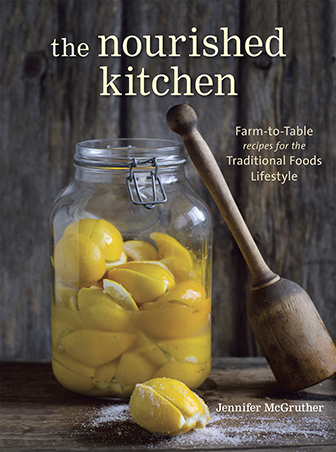 This article, published in the journal of the Weston A Price Foundation – Wise Traditions, provides a good case for the value of fat in the human diet. 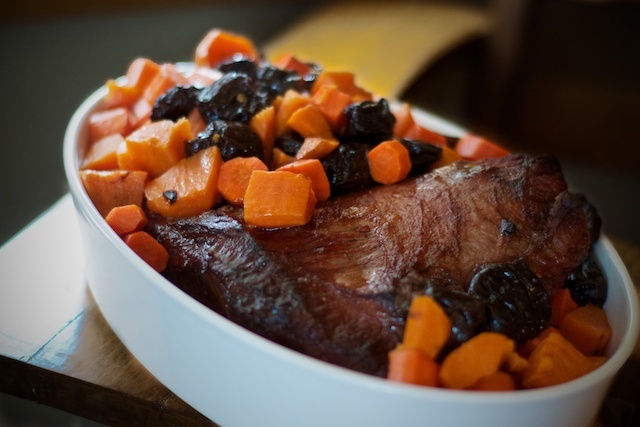 While this grass-fed beef brisket, slowly simmered with tzimmes certainly derives much of its flavor from the use of a good quality grass-fed beef tallow, that flavor is further complemented by the sweetness of of carrots, prunes and sweet potatoes. Vegetables, like meat, are also good sources of micronutrients, including carotenoids and minerals like manganese. Evidence indicates that the vitamins and antioxidants found in these foods are better absorbed when eaten with fat = making the combination of grass-fed beef and tallow with the tzimmes even more valuable. Serves: about 6 to 8 servings. A special occasion meal, grass-fed beef brisket is slowly roasted in stock and hard cider before sweet potato, prunes and carrots are added to the mix. Once the meat is done and allowed to rest, pan juices combine with more hard cider and a reduced down to a fine, silky sauce. Heat the tallow in a large skillet or griddle until it melts and becomes quite hot. Sear the brisket on each side, about three to four minutes, then place it in a clay baker, pouring one quart homemade beef stock and one pint cider over the brisket. Braise the brisket, covered, at 300 degrees for three hours before preparing the tzimmes. After three hours, or so, add the chopped carrots and sweet potatoes or yams to the brisket. Continue to roast at 300 degrees Fahrenheit for another hour. After the brisket has roasted for four hours, and the carrots and sweet potatoes or yams have cooked for one, add the pitted prunes to the clay baker, increase the heat to 375 degrees Fahrenheit and continue to bake for thirty to forty-five minutes. Remove the brisket and tzimmes from the oven, placing the brisket on a serving dish to rest and surrounding it by the tzimmes, straining the liquid from the clay baker as you do. Keep the brisket and tzimmes warm by allowing them to rest in your hot oven with the heat turned off while you prepare the reduction sauce. Melt two more tablespoons of tallow over a medium flame, adding two thinly sliced shallots to the hot fat. When the shallots release their fragrance and begin to caramelize a bit, add the braising liquid and additional cup of hard cider to the saucepan. Simmer slowly until the liquid is reduced by half. Slice the brisket, serve with tzimmes and reduction sauce. I made this for dinner tonight and it was delicious. I definitely need to start buying more brisket. It’s so easy and much more affordable cut of meat. I did make a few changes, primarily because of time constraints and what I had on hand. I used pork lard to sear the meat because I didn’t have any tallow and omitted the carrots when I realized I was out. Then I used the slow cooker and skipped the reduction sauce (mostly because I was rushed on time during the dinner hour and everybody was ready to eat). I’m sure it would have added more flavor, but it was still very good without it. 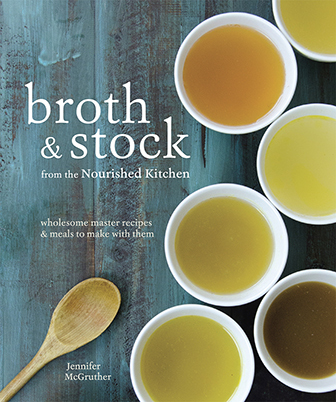 Like many of your other recipes, this will definitely stay in the rotation! My brisket is only two pounds, should I cut the cooking time in half? Don’t want to dry it out & I don’t have much experience cooking brisket…thank you! I haven’t made it with that small a brisket – but I would start by cutting the cooking time in half, testing it and working from there. This sounds delicious! Any ideas with what to do with leftovers?